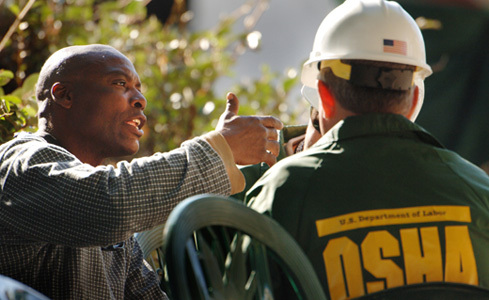 WASHINGTON – The Occupational Safety and Health Administration honored Workers Memorial Day, April 28, by focusing on deaths among one of the most vulnerable groups of employees, contract workers. The most recent data available, from the 2011 Census of Fatal Occupational Injuries, show contract workers, defined as workers “employed by one firm but working at the behest of another that controls the job site,” suffered 542 on-the-job deaths that year, out of a national total of 4,693. One fifth of contractor deaths were in construction. “Given the number of temporary workers and the recent high profile fatal incidents, the agency is making a concerted effort using enforcement, outreach and training to assure temporary workers are protected from workplace hazards,” an agency headquarters memo to its field inspectors says. And recent OSHA inspections showed that “temporary workers have not been trained and were not protected from serious hazards due to lack of personal protective equipment” when working with chemicals, among other hazards, the agency said. Press Associates Inc. (PAI), is a union news service in Washington D.C. Mark Gruenberg is the editor.